Through the sadness of death and personal tragedy and loss, the Bible reveals deeper truths of even greater magnitude about the origin of human mortality. God's response and His ultimate solution to the heart-wrenching problem reveal the love of a Creator whose character according to the Bible is the embodiment of love. This colorfully illustrated 32-page magazine shares the Bible truth about death and the sacrifice that God made to bring it to an end. Modern and final deceptions regarding death are exposed and the Bible promises of eternal life are emphasized. This magazine was first published in the year 2000.
online text. If you have a United States or Canadian post office address, Project Restore will be happy to send a complimentary copy of this magazine to you. Please use this form to make a request. 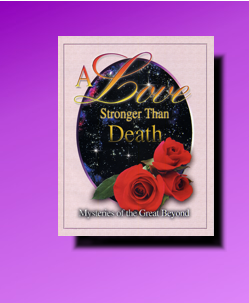 If you don't have a U.S. or Canadian address (or even if you do), we invite you to read A Love Stronger Than Death online. Please click on the link to the left.